Official IRC channel is #TheSteamTank on Espernet! If a link in this thread doesn't work, please see the bottom of the post. 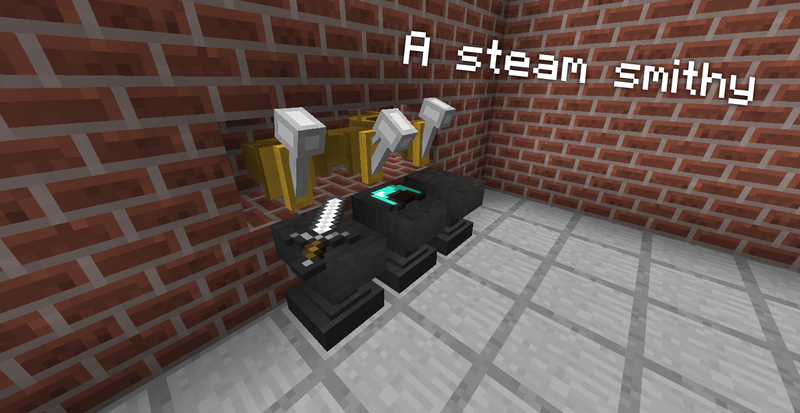 Flaxbeard's Steam Power (FSP) is a tech mod based on steam power at its core. 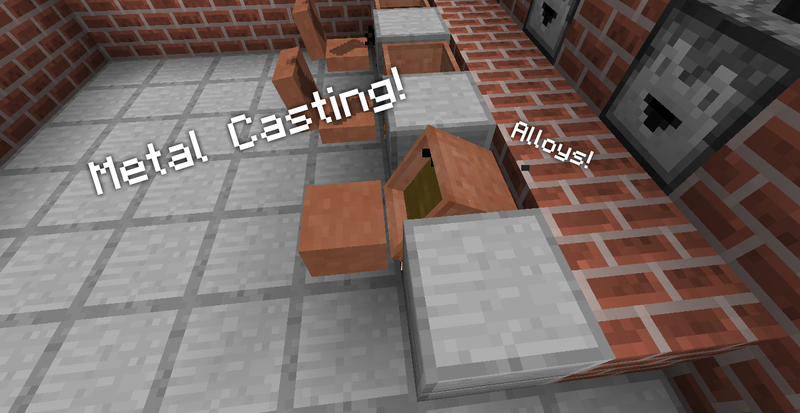 It was originally developed by Flaxbeard, then Flax + Zenith, then myself, now the Esteemed Innovation Team. Its goal is to add innovative content that encourages fun play rather than trying to one-up other tech mods. FSP includes in-game documentation in the mod's book, Esteemed Innovation. 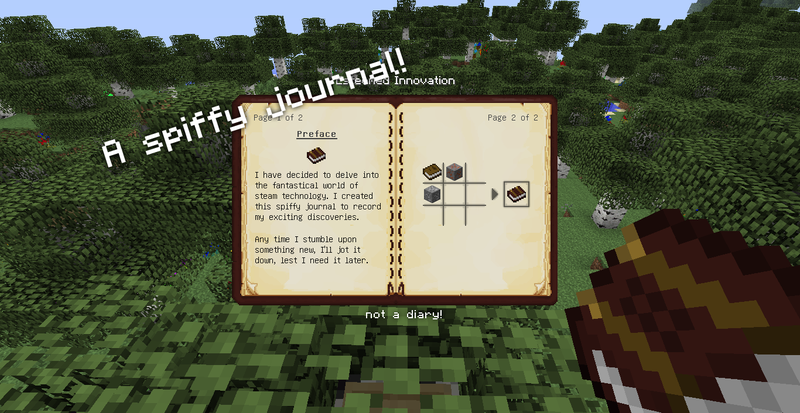 This journal can be crafted after collecting the two ores necessary for progression: copper and zinc. Just check the issue tracker. 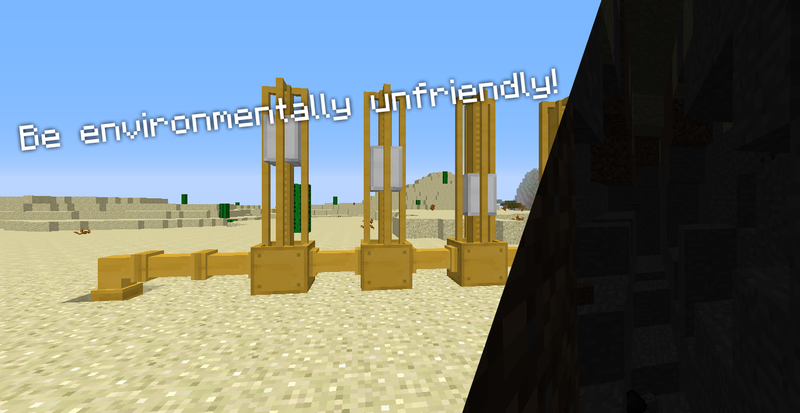 You are free to use this mod in modpacks. I'd like it if you let me know so I can check it out. I'd also like it if you report bugs at the issue tracker, or let me know in some other way. Support the team on Patreon! Is your modpack running FSP? Give me a link so I can add it here! Visit the Feed The Beast Wiki! I'm a programmer, and make mods sometimes. Look at my GitHub for all my projects. Lookin' good as always! Since my post got somehow misplaced in the last thread, I'm going to try and post it again here. I would like to make a suggestion if you'd have it. Do you, by any chance, have an upcoming feature regarding some steam machines? I mean, like steam golems? Or the steam thingamajigs from Skyrim? 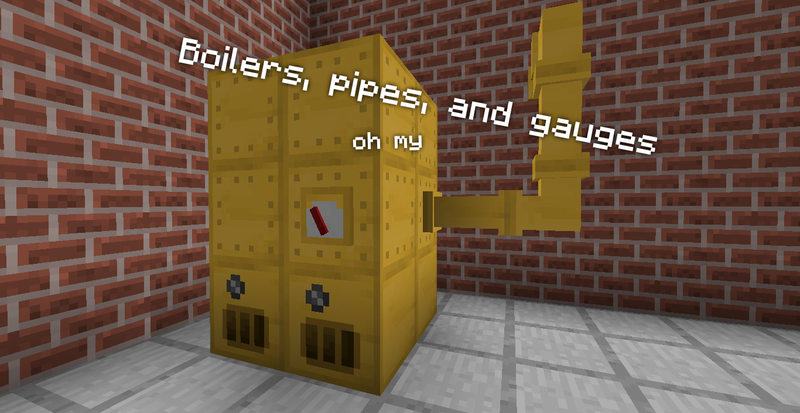 I'm a huge fan of steampunk, and I'd love to conquer the free Minecraft worlds with endless armies of brass machines of mass destruction So, there you have it - but I'll patiently await any update you make! Loving the mod so far! Oh. I don't really see the point, or it fitting with the theme at all. i made the same mistake, this is steam POWER, NOT STEAMPUNK. It was just a suggestion. Well, I guess I missed the theme, my apologies. Loving the mod. What I want to see is a player mortar that fires a player into the sky then drops you at a preset location. Just like the current item mortar. I also want better ways to generate steam beyond the coal burning method. Maybe an electric boiler that could interface with some power system from another mod. Another fun thing could be a block that sits at the bottom of a tree and cuts it down, spilling saplings and logs so you need a vaccume to collect them, then you combine that with a steam powered block placer. Maybe it shoots the block until it hits something and it gets placed there. That could make for a cool tree farm. If it hasn't been suggested before, is it possible Tinkers Construct could get some support by being given a steam powered modifier? It'd be really nice and would bring the two mods together, seeing that you've got steam tools, along with both the TiC and Steam Powered armor types being similar in a few ways. I plan on doing some sort of Tinkers integration. PS. Also, I forgot to add the last time (though I'm unsure whether it falls in the same category) - is some heavy mechanization out of the question too? Maybe something like mecha with steam tanks, or improvement to the exosuit? Hah, I'd love to do some tough mining in a heavy mech, sure! Anyway, best of luck to whatever you make. On AI: I hate AI a lot. My first (unreleased) mod was basically all AI, and that was awful. Oh, I see! 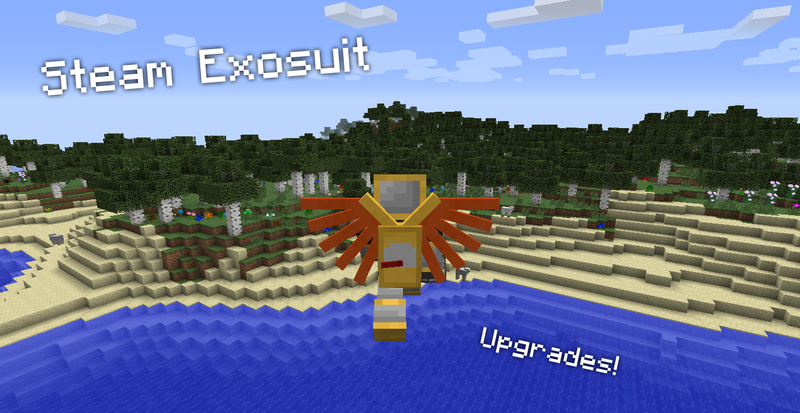 Well, regarding the exosuit - while I'm more than amazed by the current design, I think you could add another variation of it - a larger one, for instance, customizable much like the original was (that feature really sets apart this mod from the others, really splendid work!). For example, one think I always find myself lacking is a flexible way to transport large amounts of items or blocks without resorting to railway or pipe systems where they are impossible or uneconomic to place. My idea was that you could add a machine or construct (call it whatever you'd like) which the player could pilot for enhanced carrying ability, mining, farming, or even combat. Perhaps crafting different types of plating would change its role and characteristics, while changing the tools it uses (maybe crafting something akin to steam drills or axes) would change its application. It could extract intact blocks from the world and carry them, carry out deforestation at an improved pace, lay steam lines or interact them in ways (drain or add steam into the system) etc. etc. The ideas revolving it are almost endless! Well, I think I've explained it a bit better (don't want to smother you after all :D) and I hope I've helped you at least a little bit with ideas. Thanks for wanting to hear my ideas. I am very eager to see where you and Xbony2 take this mod, flax had it off to a great start, but it still feels feels like what's in at current is just the start. Cheers and good luck, I will def be following the progress of this mod! That's Curse's crappy forum software's fault for not handling non-normal links correctly. Anyway, I added a link at the bottom, but you'll have to right click and choose "Go To..."
"also i suggest a steam powered chainsaw sword that acts like shears and a sword"
I have plans for modular tools. "i also heard that there going be a steam powered handcannon/bazzoka dont know what going to shot cannon balls of cobble stone and iron? or use gunpowder ? i like idea of it being called a handcannon over bazzoka also"
1. where did you hear this? 2. Rocket Launchers are a thing. "also another sugestion would be adding plating for exosuit from tinkers construct metals and in far future since argghh all them metals of metalurgy even if alot metals have share protection stats though you might think of some unique plate effect/protection stats just haveing the capatability there would be amazing even if dosnt matter that 8 metals in the mod all give protection the color choices and the vareity of choices would be helpfull as often i feel like i should be saveing my iron gold and brass for other crafting resipes and use fantasy metal that can save me on usefull resources"
Not sure about Metallurgy stuff, I know there's an insane amount of metal, and I don't think there's anything unique about them. Could be wrong. I plan on adding some sort of Ti C support, just not sure what yet. "also i dont know what your mod could offer to tinkers exsept brass tools and steam power upgrade able to recharge tinker tools durability at the steam filler but thats my suggestion"